The National Football league is obviously full of bright minds coaching all three phases of the game but every now and then plays pop up that really demonstrate just exactly how good those guys are at setting plays up off of one another. The Buffalo Bills played the Minnesota Vikings early this year in Minneapolis and one such play jumped out at us here at FirstDown PlayBook. The Bills had more than likely shown the bubble screen before on video, which is not novel since almost everyone runs some form of the bubble these days. What made this red zone play special was that it really combined three different concepts. There was the bubble screen look that the defense had to respect and then there was the bubble screen fake and go which is a bit tricky but still not that uncommon. The Bills did not stop there. Where the Bills outdid themselves is that they mixed in a post/wheel switch concept with number two and number three as the screen receiver became number one. The way this play was designed the Mike linebacker essentially had zero chance of being right on this scheme unless he was ready to cover the wheel route which he certainly could not. Confused yet? 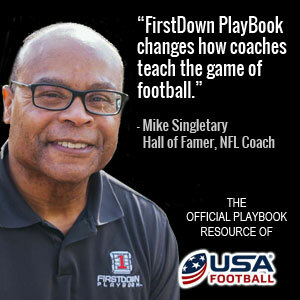 Watch this short video and get ready to start drawing this play up or you can just go get it in FirstDown PlayBook!